PARIS — The far-right party of Marine Le Pen was poised to make major gains after the first round of voting in regional French elections on Sunday in the wake of terrorist attacks that traumatized the country last month. When the votes were counted, Ms. Le Pen’s National Front party was pulling far ahead in two of France’s 13 regions and leading in four others. Trailing were the right-leaning parties, including the Republicains, led by former President Nicolas Sarkozy. Even further behind were the Socialists, whose best-known figure is President François Hollande. Appearing before her supporters, Ms. Le Pen called it a “magnificent” result, saying the National Front was “the only party that can reconquer the lost territories of the republic, of Calais, where we won 50 percent of the votes, or of the suburbs.” What Ms. Le Pen described as “lost territories” were the French city of Calais on the English Channel, which now has more than 4,000 migrants on its doorstep hoping to reach Britain, and the suburbs of major French cities, many of which have sizable Muslim populations. With 100 percent of the votes counted, the turnout nationwide was 50 percent, which was somewhat higher than in the last regional elections, in 2010. The National Front received 41 percent of the vote in the northern region known as Nord-Pas-De-Calais-Picardie, as well as in the southern region of Provence-Alpes-Côte-D’Azur, and members of the Le Pen family were at the top of the ballot in both regions. Ms. Le Pen headed the group of National Front candidates in the north and her niece, Marion Marechal Le Pen, headed the list of candidates in the south. In the eastern region of Alsace-Champagne-Ardenne-Lorraine, Florian Phillipot, who is Ms. Le Pen’s top lieutenant, took 36 percent of the vote. The second round of voting next Sunday will determine the final results. In the last several elections the National Front has done well in the first round but found it harder to sustain gains in the second, when other competing parties have united or withdrawn to keep the far right from winning. However, this time the high numbers for the National Front in a number of places suggest that the old political calculus may not hold, especially if the more traditional conservatives led by Mr. Sarkozy refuse to join with the Socialists to form a bloc. Mr. Sarkozy announced after his party’s second-place showing that its candidates would not join with other parties or withdraw from the race. In contrast, Jean-Christophe Cambadélis, the head of the Socialist Party, said that its candidates would withdraw from the elections in the two regions where the National Front did best, and that elsewhere it would join with other parties. “The party of the extreme right threatens many regions of France,” Mr. Cambadélis said. “The left is, then, the last rampart of Republican France against the xenophobic extreme right,” he said, calling on all the left-leaning parties to join together to defeat the National Front. Ms. Le Pen and her party have thrived on an anti-immigration message that has verged on anti-Muslim, as well as a call for re-establishing European borders. These notions had already found traction as France faced an influx of Muslim immigrants from war-afflicted areas of the world. But she gained even more momentum after the attacks in Paris on Nov. 13, in which 130 people were killed. However, several analysts said it was important not to overplay the recent attacks in explaining her success. Rather, they see a long-term trend in which the National Front has gained ground in election after election. It has done so even more rapidly since Ms. Le Pen took leadership of the party from her father, Jean-Marie Le Pen, in 2011. 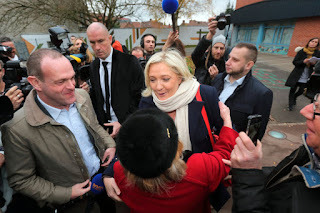 “The dynamic in favor of the National Front is not a superficial reaction of the French electorate in a situation of crisis after the attack,” said Bruno Cautrès, a political analyst and public opinion specialist at the Center for Political Research at Sciences Po. “It is something more long lasting in the French political system,” he said. The outcome will be read here as a forecast of the politics of the presidential election in 2017, but already Ms. Le Pen has changed the tenor of political debate in France. Across the political spectrum, politicians are taking a harder line on immigration, and there is a newfound willingness to reconsider the rules that govern the open borders among European Union countries. “She had won before the vote,” said Joël Gombin, a political analyst at the Observatory for Radicalism at the Jean-Jaurès Foundation, a think tank. “The old themes and proposals of the National Front have been reprised in the political debate, not only on the right but also, more and more, on the left and in particular in the voice of the executive branch, and that legitimizes the National Front,” he said. Both Mr. Hollande and Prime Minister Manuel Valls have evoked more nationalistic themes recently and taken a particularly hard line on security issues. Although the government is leans left, its leaders have begun to discuss extending the state of emergency, which gives law enforcement extraordinary powers, beyond its current duration of three months. Public figures from different sides of the political spectrum urged voters to go to the polls on Sunday, not least of all because of worries from both the Socialist party and the Republicains that they would lose ground.